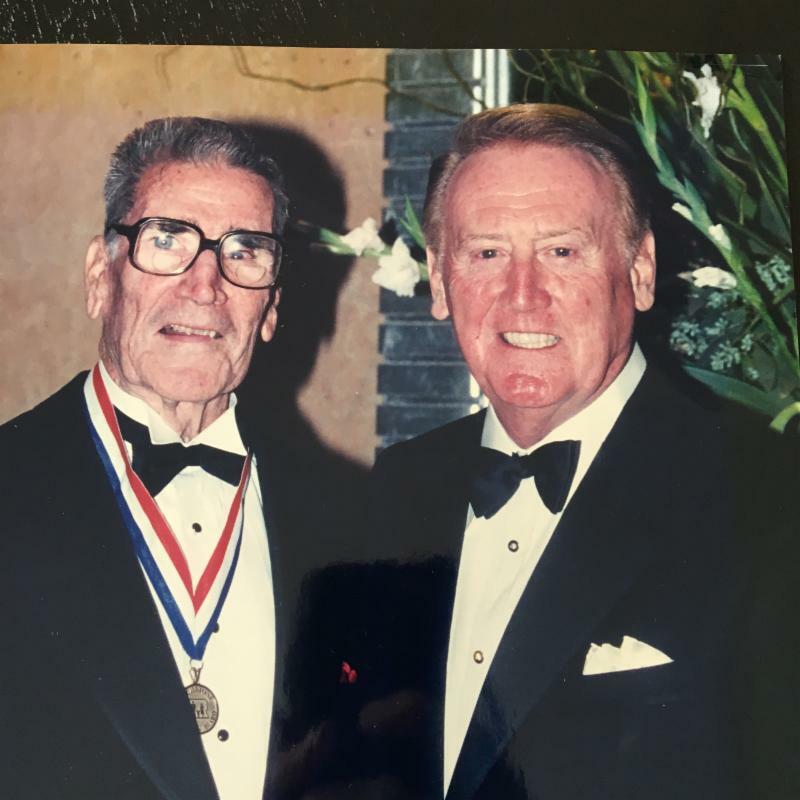 Old friends Jim Murray (left) and Vin Scully. It took baseball in its wisdom 10 years to turn Babe Ruth, the most perfect hitting machine of all time, from a pitcher into a slugger. It took football seasons to figure out Marcus Allen wasn't a blocking back and to hand him the football. And it took network television forever to get the message that Vin Scully should do major league baseball and stop fooling around. It wasn't that Scully was inept at other sports. It was just that he was miscast. It was like Errol Flynn playing a faithful old sidekick. Scully could do golf and do it well. Rembrandt could probably paint soup cans or barn doors, if it came to that. Hemingway could probably write the weather. Horowitz could probably play the ocarina. But what a waste! Nobody understands baseball the way Vin Scully does. He knows it for the laid-back, relatively relaxed sport it is. Scully is the world's best at filling the dull times by spinning anecdotes of the 100-year lore of the game. He can make you forget you're watching a 13-3 game, as we were Wednesday night at Chicago, and take you with him to a time and place where you are suddenly watching Babe Ruth steal home. He is like a marvellous raconteur who can make you forget you're in a dungeon. He can make baseball seem like Camelot and not Jersey City. He knows baseball fans are ancestor worshipers, like the British aristocracy, and he can invest a game with allusions to its gaudy past that give meaning to the present. We suddenly see knights in shining armor out there carrying on a glorious tradition instead of two rival factions of businessmen trying to land the order. Football requires screaming. "They're on the five and it's second down and goal to go!" "They're on the three and it's third down and there's 29 seconds left to play!" Baseball requires humor, deft drama, a sprinkling of candor, mix well and serve over steaming hot tradition. Scully knows the sport as few do. He learned it at the knee of Branch Rickey at the time he was most impressionable, a young, ambitious, career-oriented student out of Fordham. Scully will tell you why a batter should try to hit to right with a man on first and none out. ("The first baseman has to stay on the bag to keep the runner close. The second baseman has to cheat a step toward second in the event of a steal or a double play. There's a hole there you could dock ships.”) But finally, the pairing of Scully with Joe Garagiola was an inspired piece of casting, not quite like Burns and Allen or the Sunshine Boys but a matchup quite as important to baseball as Ruth and Gehrig or Tinker and Evers and Chance. I originally thought that was a lot of ego for one stage, or one microphone, but the two have locked into place like tongue in groove, or in this case, tongue in cheek. Garagiola is the locker-room wit, the jokester from the team bus. Scully brings out the best in him, and he brings out the best in Scully. When the ballgame starts with the pitcher throwing two baseballs out of the infield and the third baseman following suit in the bottom half of the first, Garagiola pronounced it "a real Halloween inning" and later suggested that the ritual disclaimer, "This game is the property of major league baseball," be waived since presumably nobody in the big leagues wanted to claim this game. Later, when Scully noted that a certain pitcher had "retired 53 of 58 batters who faced him," Garagiola wondered, "Why wouldn't you try to sign those five guys?” When a pitcher built along the general lines of King Kong took the mound, Garagiola observed, "He's an 8 on a seismograph. His birthday is Monday, Tuesday and Wednesday." Later, Joe said of a pitcher with a roundhouse, hanging curve, "He throws an American Legion curveball.” Later, when Scully said that a bearded infielder "looks as if he fell off a box of cough drops," Garagiola noted: "If he shaves, he only weighs 91 pounds." When a pitcher wearing more gold chains than a wine clerk appeared, Scully noted that "he looks as if he just came from Westminster Abbey.” It was all good clean fun. They brought out the best in each other. No one noticed the game was boring. Because it wasn't in the broadcast booth. That's one of the things that made this game great all along.